The serialNumber element contains a long integer that is unique to that individual issue. If you export issues several times from the same instance of Burp, you can use the serial number to identify incrementally new issues. The type element contains an integer which uniquely identifies the type of finding (SQL injection, XSS, etc.). This value is stable across different instances and builds of Burp. The name element contains the corresponding descriptive name for the issue type. The path element contains the URL for the issue (excluding query string). The location element includes both the URL and a description of the entry point for the attack, where relevant (a specific URL parameter, request header, etc.). 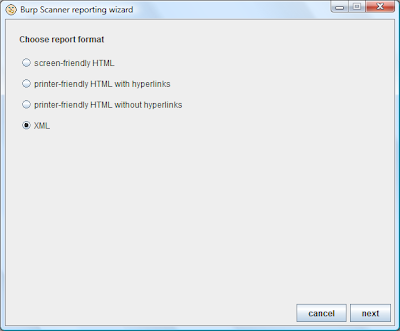 The other elements, some of which are optional and can be selected by the user within the reporting wizard, are hopefully self-explanatory. Now, edt, the clock is ticking for the Dradis function to import Burp Scanner issues! If the method returns, the user cancelled the shutdown prompt.